Creepy news, everyone! There's been some movement in one of the most disturbing serial killer cases in forever. In June of 2010, 57-year-old Lonnie Franklin Jr. was arrested and charged with 10 counts of murder and one count of attempted murder in the deaths of women over several decades in South Los Angeles. Terrifyingly nicknamed the Grim Sleeper because it's believed he took a hiatus from 1988 to 2002, he's now awaiting his trial. Franklin has pleaded not guilty to 10 charges and the prosecutors said they will seek the death penalty. In the meantime, the LAPD has released more photos found at Franklin's house and they're hoping the public can help to identify the women in them. Critics of the LAPD's handling of the case are saying it's about freaking time, and that the only reason that Franklin was on the streets for so long is because the women he was sexually assaulting, strangling, and shooting were poor and black. Yesterday afternoon, the LAPD released 42 photos of unidentified women taken between 1976 and 2010, with the thought that someone out there might be able to identify the possible victims. Just a warning, some of these photos contain women that it's not obvious whether they're dead or live — there's nothing overly graphic, but just a head-up. Keep in mind that these photos — taken from Polaroids, video stills and undeveloped negatives — are 20 to 30 years old, and that people age. Of course, if you have any information on these women, please get at the LAPD at 800-222-8477. Many believe that the reason there are so many victims, and that the killings went on for so long, is because the women were largely poor, black women, some of them prostitutes. Christine Pelisek, a reporter with the LA Weekly at the time, and widely considered to be the person who bust the case open with her top-notch reporting, broke some crazy facts on the case in 2008. She writes extensively about city officials and top brass at the LAPD repeatedly botching the case investigation, including not collecting Franklin's DNA when he was arrested on a felony and put on probation in 2003, even though it was the law. 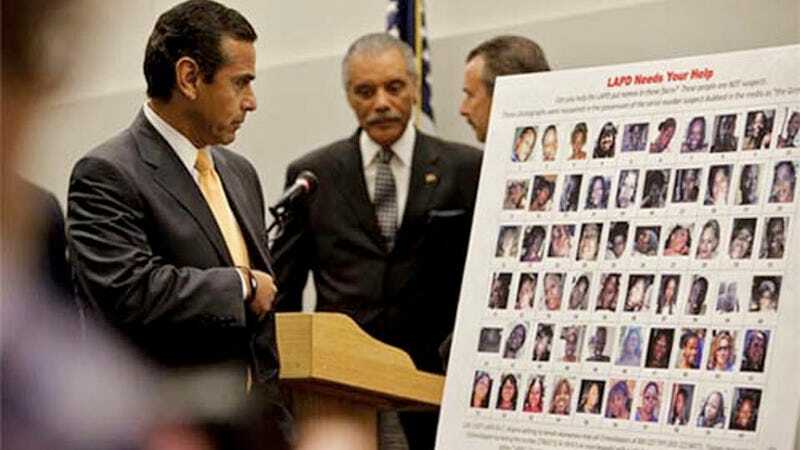 But neither [LA Mayor Antonio] Villaraigosa nor [former LA Police Chief] Bratton tried to alert the city. If they ever had, one woman who would be hyperaware of it is Minister Pat Jones of the First Church of God in Inglewood. Jones, who is also co-chairwoman of the Southeast area neighborhood council and the Southwest area neighborhood council, was stunned to hear from the newspaper about the existence of the Grim Sleeper. "How come [they] haven't involved the community? There are no fliers or nothing. In order for us to work on it to stop it, we have to be all-inclusive and involve everybody. We have to flood the neighborhood. This is serious. ... We need to have a press conference to talk about it." Laverne Peters had long suspected that Janecia's death was part of something bigger. Her daughter's murder case was transferred from 77th Division to the specialized detectives "downtown" in 2007, and she knew that one easily forgotten young woman would not merit such an elite investigative crew. "It doesn't take a scientist to figure it out," she says. But when LAPD detectives paid Peters a visit, they didn't come clean with her. The city's failure to involve the families, she believes, stems from the fact that "they are poor little black girls." Heartbreaking and infuriating. And it wasn't even just the requests of victim's family and friends' they ignored, there were actual groups formed to petition the LAPD to become more active in violent crimes against minorities. So many "body dumps" were occurring during that ugly era that angry residents lashed out at police, and in 1986 launched the Black Coalition Fighting Black Serial Murders. The coalition declared that "the low-profile media coverage and problems with the investigation are all examples of women's lives not counting and black prostitute women counting least of all." In late August 2008, Pelisek contacted Police Chief Bratton's office to discuss the Grim Sleeper story. At the time, Franklin was still committing crimes, and Bratton hadn't even sent out a press release about it. Pelisek was told by an aide that the chief was "too busy to comment." The very same day, he received big press for speaking about the arrest of the "Silverware Bandit," a man who had been caught stealing cutlery and china. Yep.